Most scientists believe the rate at which the moon and Earth have been bombarded by meteorites has remained constant for the past two to three billion years. Understanding the age of craters on the moon can help us better understand the age of our own planet because the Earth would have received similar numbers of impacts. It’s been assumed that the rarity of young craters on Earth (those created 300-600 million years ago) is attributed to preservation bias — craters have been erased over the years by erosion and the movement of the Earth’s plates. Since then however, using a new method to date craters on the moon, my colleagues and I have determined that the rarity of craters 300-600 million years is due to a lower bombardment rate. In fact, the bombardment rate has increased by a factor of two to three in the past 300 million years. To test this idea, we compared the Earth’s crater record to the moon’s in an article published in the journal Science . We suggest that the scarcity of terrestrial craters that are 300-650 million years old is simply due to a lower bombardment rate during that period — and not due to preservation bias. The moon’s surface serves as a time capsule, helping us to detangle Earth’s history. There are tens of thousands of craters on the moon and the only way to see if the bombardment rate has changed is to have an age for every single crater. Traditionally, dating craters is done by recording the number and size of superimposed craters on the ejecta — the material displaced by impact — of each crater. However, these methods are extremely time-consuming and limited by image quality and availability. In our work, we use a new method to determine the ages of lunar craters, employing temperature data from the Lunar Reconnaissance Orbiter’s Diviner instrument. This innovative method uses the rockiness of large craters’ ejecta as an alternative means for estimating the ages of Copernican craters (those younger than one billion years old). This method works on the assumption that large lunar rocks have high thermal inertia and remain warm through the night, whereas the fine sand particles, called regolith, lose heat quickly. A simple analogy for the concept of thermal inertia is rocks and sand at the beach. During the day both large rocks and the sand are warm. However, as soon as the sun sets, the sand gets cold. The large rocks which have a higher thermal inertia, however, stay warm for longer. Analysis shows young craters with numerous metre-sized fragments are easy to pick out from older craters with eroded fragments. As time goes by, these large rocks get broken down by future small impactors. Eventually, over the course of about a billion years, all of the rocks form into lunar regolith (a fine layer of dust covering the Moon’s surface), providing an inverse relationship between rock abundance (the rockiness of a crater’s ejecta) and crater age. As craters get older, they become less rocky. Using measured rock abundance values, we computed ages for 111 lunar rocky craters larger than 10 kilometres in diameter that formed between 80°N and 80°S over the last billion years. Using the ages of these young craters, we determined that the production rate of large lunar craters (more than 10 kilometres in diameter) increased by a factor of two to three in the past ~300 million years. Thus, the near-Earth objects population has increased over the last billion years. 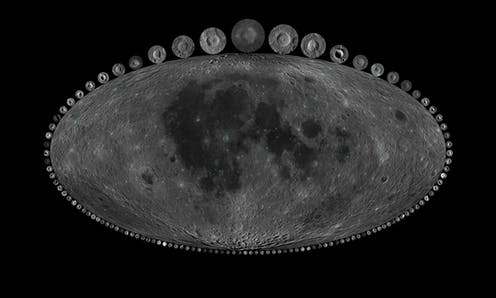 The size and age distributions of lunar and terrestrial craters larger than 20 kilometres over the last 650 million years have similar shapes. This implies that large crater erasure must be limited on stable terrestrial terrains. It also implies that the observed deficit of large terrestrial craters between 290-650 million years is not preservation bias, but a reflection of a distinctly lower impact rate. If we had observed more dominant erosion, the age distribution of terrestrial craters would be strongly skewed toward younger ages. Using data from the recent study on Moon craters, SYSTEM Sounds created this video and accompanying soundtrack. Support for limited erosion on cratered terrains also comes from records of kimberlite pipes on Earth. Kimberlite pipes are carrot-shaped pipes that extend a couple of kilometres below the surface and are often located on the same stable regions where we would find preserved impact craters. These underground pipes have been widely mined for diamonds, providing scientists with plentiful information about their location and erosion state. Records show that kimberlite pipes have not experienced much erosion since forming around 650 million years ago. Therefore, the large young impact craters found on the same stable terrains must also be intact, providing us with a complete record. The cause of this increase in the bombardment rate is still unknown. However, a hypothesis is that an asteroid family breakup caused a larger amount of debris to leave the asteroid belt and head towards our region of the Solar System. The loss of most craters older than 650 million years could be due to erosion from Snowball Earth, when most of Earth’s surface was frozen around 650 million years ago. We predict that the rare extinction-level event type craters like Chicxulub, which may have lead to the extinction of the dinosaurs, were a byproduct of the current high bombardment rate. These new findings could have implications for the evolution of Phanerozoic life — our current geologic era — and the history of life including extinction events and evolution of new species.